Preliminary Chart of Rappahannock River Virginia from Entrance to Deep Creek. 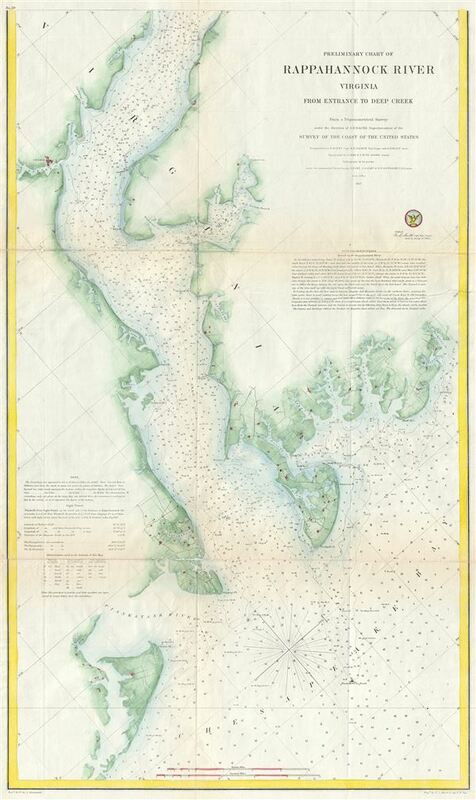 This is an attractive hand colored example of the 1857 U. S. Coast Survey nautical chart or maritime map of the Rappahannock River, Virginia. The map focuses on the southern part of the Rappahannock River from where it enters into the Chesapeake Bay, and covers its course from Deep Creek to the Chesapeake, including Urbana, the Corrotoman River and the Piankatank River. The chart offers countless depth soundings in feet and several navigational notes, but little inland detail. However, it does identify the town of Urbana on the western shore along with other smaller settlements, farms and roadways. The Rappahannock River, which extends westward into Virginia from the southern part of the Chesapeake Bay, was an important trade artery and boundary since the early colonial period. Shortly after this map was produced the Rappahannock would become a major point of contention in the American Civil War, with the Union controlling its northern shores and the Confederacy, it's southern. The triangulation for this chart was accomplished by E. Blunt, J. Farley, and Captain W.R. Palmer. The Topography is the work of John Seib and I. Hull Adams. The Hydrography was completed by a party under the command of S. P. Lee, J. J. Almay and R. Wainwright. The whole was compiled under the supervision of A. D. Bache, one of the most influential American cartographers of the 19th century. This chart represents plate no. 20 in B. Peirce's 1857 Report of the Superintendent of the United States Coast Survey. Bache, A. D., Report of the Superintendent of the United States Coast Survey, (Washington) 1857. Very good. Minor wear and toning along original fold lines. Professionally flattened and backed with archival tissue.